I also really enjoy supporting local businesses and products. 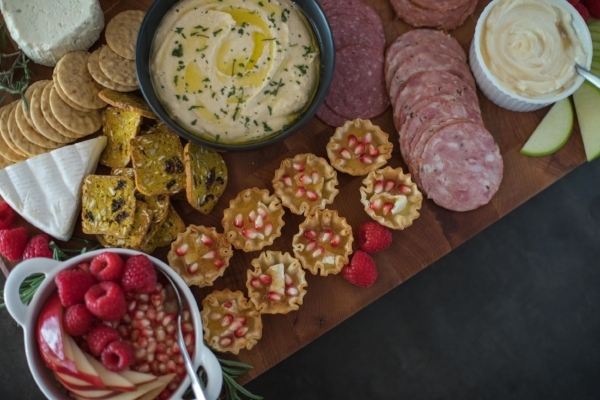 My goal for this fall was to track down delicious and beautiful products created in our community that we can all keep on hand to throw together a beautiful charcuterie board for any gathering you are hosting or attending this season. I quickly discovered Baton Rouge is full of gems if you know where to look. Let’s take a look at some local finds, my basic tips for building a beautiful board, and one of my favorite beautiful and ridiculously simple recipes for hosting! I first spotted Iverstine Farms Butcher at the Red Stick Farmer’s Market before discovering their beautiful storefront on Perkins Road. Not only do they have a beautiful selection of pasture-raised, Louisiana-farmed meats, but they are also offering a beautiful selection of specialty charcuterie meats this season. Visit them before any party to get some goodies. I have seen such growth in the local market of specialty food items and there are treasures to be found. Visiting Southside Produce or Alexander’s Market proves a treasure trove of locally made goodies. I love Ewing Farms goat cheese, and their honey flavor is perfect served alongside some crisp tart granny smith apples. Also grab the Dip Me Sour Cream dip to add that Cajun flair and spice to your spread. The Cultured Guru pickles offer a nice tangy option to your plate, with the added benefit of being an incredible health food. Mom’s Garden has created delicious Mediterranean Dips and spreads like Baba Ghanouj and hummus that also make a great addition. You can also visit my website for my go-to hummus recipe (used here). • Add some sweet to your salty. When serving meats and cheese, I like to balance savory and sweet. • Remember your gluten-free guests. • With so many different dietary restrictions, I try my best to accommodate anyone who may come by. I always try to have some rice or nut-based crackers as an option for those who can’t eat gluten. I also find that creating a simple nut mix is a nice touch. • Balance your cheese. Pick a variety of cheese from different categories. • Snip a few fresh herbs from your garden as a lovely garnish as a finishing touch before your guests arrive. Pull the phyllo dough shells out of the freezer and line on a baking sheet. Cut brie into small cubes that will fit inside of the shells. Place in the oven for 8-10 minutes, until the cheese is melted nicely. Remove from the oven + top with a dollop of fig preserves. Allow them to cool before you sprinkle with a few fresh pomegranate seeds to top. 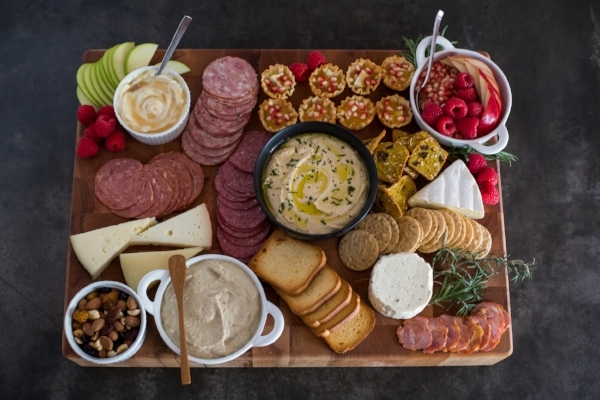 Serve alongside any cheese or charcuterie board and be delighted as your guests are amazed at your simple yet elegant creation!